Sabertooth is a lightweight and free chess engine written in C. It is fully UCI-compatible, for use with your favorite chess GUI. It currently plays at moderate-to-amateur strength, and improves every day! This is an open source project. The code is located here. Sabertooth works with Mac OS and Linux. It doesn't presently support Windows, but support is coming soon! (The only incompatible library is POSIX threads.) Sabertooth requires a 64-bit computer. How can I get Sabertooth? Download it using the link above! 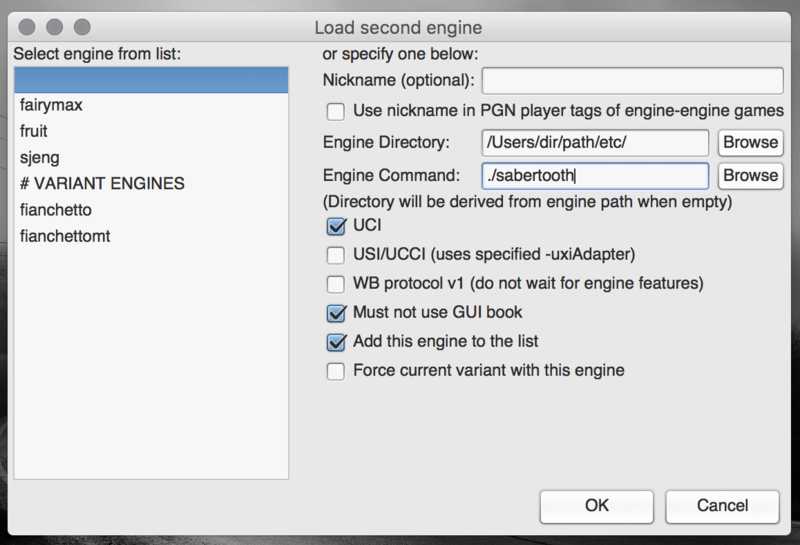 Since Sabertooth is a UCI engine and doesn't include a GUI, you will need your own. I recommend XBoard, which has an excellent Mac port. First, download the engine from the link above, and put it somewhere you'll remember. Then download the XBoard package for Mac or Linux. The engine command is ./ followed by the name of the engine file. Here, it is ./sabertooth. Be sure you have checked the "UCI" box. Sabertooth is developed by Dylan D. Hunn (@dylhunn). Please report any bugs you discover to me!